Of all the areas that have improved with drastic technological advancement, healthcare seems to have benefitted the most. Mobile app development specifically has had a significant impact on the progress of the healthcare industry in general. From performing functions like encouraging doctor-patient interactions, medical record management to streamlining the treatment as a whole, healthcare mobile apps are helping us lead longer, healthier lives. People today use healthcare apps for personal knowledge enhancement, to compare prices, locations and reviews and tracking biological data too. Streamlining diagnosis to reduce waiting time for patients. Reducing the chances of human errors. An omniscient system to refer to when you need any information or resources related to a condition. Easy references to Big Data solutions for those seeking answers to medical queries. Significant reduction in the need for clinic visits for the patients. Reduced medical expenses for patients. The option of crafting personalised health plans for patients with customisation options like pill reminders and appointment scheduling etc. Google Deepmind, IBM Watson, and IBM Medical Sieve are some of the popular projects that are bringing together the expertise of AI and healthcare services. Organizing data from an array of clinical and nonclinical sources, for reference by practitioners. Advanced technology that ensures the protection of privacy and security of data. Safe access to the data, through democratically. Singular security procedure eases the process, assures the patients of the data security. Aids in securing EHR (Electronic Health Record) and follow the compliance requirements. Integrating Blockchain technology into healthcare app is a modern day necessity. There has been an upsurge in the adoption of wearable devices to aid activity, exercise, blood pressure and heartbeat tracking etc. Use of these wearable helps a patient collect necessary data on point of origin and a practitioner in to access it anytime and analysis it. Massive adoption of internet practices and the growing popularity of mobile and wearable devices contribute to creating a seamless experience in a well-synchronised healthcare environment. By 2019, the healthcare wearable sales is expected to grow to around 4.4 billion U.S. dollars globally. Telemedicine is not essentially a ‘latest’ trend in healthcare. However, new advances in communication technology have added to the convenience and made telemedicine a popular choice for both patients and doctors. A telemedicine app helps a patient get medical expertise 24/7, remotely from anywhere. Patients can now get medical prescription and check-ups without seeing the doctor physically. According to a report by Statista, the total number of telehealth patients worldwide in 2013 was 0.35 million which is forecasted to grow by 7 million in 2018. Telemedicine is a great way to avail treatment for the chronic condition of the patient regardless of time and location. Telemedicine equals greater accessibility and facilitation. Widespread adoption of latest technologies enhances the user experience by fits and starts. Today, the healthcare industry is increasingly leveraging Augmented Reality/ Virtual Reality application to benefit patients and doctors alike.AR /VR benefit the training and learning practices of the medical practitioner by engaging them innovatively. AR in healthcare mobile apps allows doctors to be a part of the live diagnosis. This can also train multiple doctors at a given time simultaneously. AR laced mobile apps for healthcare present useful info to doctors at their fingertips. Surgeries are performed using endoscopic cameras with visuals displaying on the monitor. This makes it difficult for surgeons to perform the operation while keeping an eye on the screen. Modern innovations like AR/VR glasses have the potential of making the process easier by presenting the visuals right in front of surgeons keeping them focused. AR/VR also contribute to improvement in the quality of treatment. Cloud computing is the big answer to data/ document storage vows of doctors. Mobility and cloud have been at the forefront of technologies helping to increase treatment accessibility for patients and doctors alike. The cloud interface allows medical institutions to store EHRs of patients that can be accessed 24*7 from everywhere. Cloud Solutions bring information about records, bills, and their health insurance plans at fingertips of parties involved, making the process more accessible and automated. Patients can also check e-prescription online on the cloud. Growing reliance on cloud solutions brings in greater dependence on health apps in turn. One of the many perks of implementation of cloud based-service to the healthcare is that it will allow the doctors to perform many operations like accessing the health information and looking for the resources instantly. Thanks to the cloud more focus on medication adherence, goal tracking, health education, detecting health hazards, conducting health checkup sessions, and doing medication analysis is projected in times to come. Electronic Health Records are patient’s digital records that contain lab results, medical history, care plans and crucial information like demographics etc for doctors to access in real time. There has been an upsurge in the inclusion of EHRs in healthcare mobile apps and is likely to remain so in the near future, with more and more people becoming conscious about their health. EHRs help doctors assess patient’s compliance with the treatment suggested. One of the biggest trend that would dominate healthcare app development is going to be M-commerce. The conveniences that M-commerce brings along with are plenty specially for the kin of patients subjected to emergency cases or who need treatment at odd hours. It is also a welcome inclusion towards a cashless economy that India inspires to be. Technological developments are all about bringing prosperity to mankind one way or the other. Healthcare sector today has leveraged the use of technology in phenomenal ways. mHealth or Mobile Health is a newbie trend that is likely to dominate the sector in times to come given the convenience of its use. However, there have been significant concerns about the security of critical data. These new technology trends in healthcare app development are likely to mitigate any threats to the popularity of mHealth. 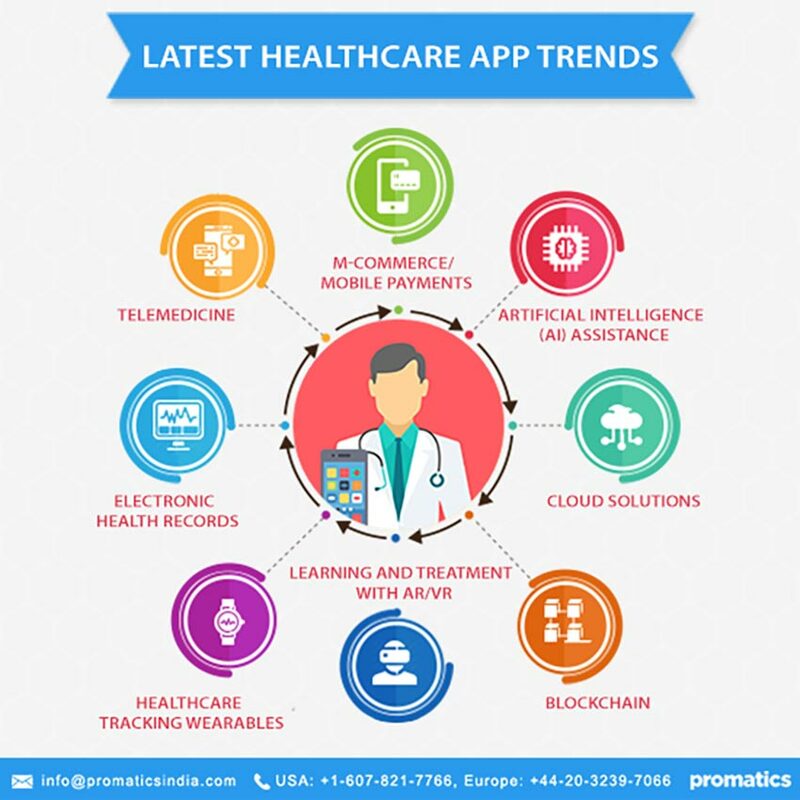 We at Promatics Technologies provide professional mobile app development services using latest technology trends in the sector and ground realities of Medicare as well. We excel at developing advanced and highly customized healthcare app solutions.